1. Dolce & Gabbana silk-front cardigan, Matches fashion, £680.00. 2. Strawberry theif print knot watch, Liberty, £59.00. 3. Riley a-line short skirt, Alice and Olivia, $198.00. 4. China floral lattice back dress, Topshop, £36.00. 5. Aldo Devoss floral bag, ASOS, £40.00. 6. Lucy in Disguise Promenade printed belted cotton dress, The Outnet, £79.75. 7. Equipment Nico printed silk chiffon blouse, The Outnet, £59.50. 8. Aldo rinks floral wedge sandal, ASOS, £65.00. Love the knot watch so unique!! 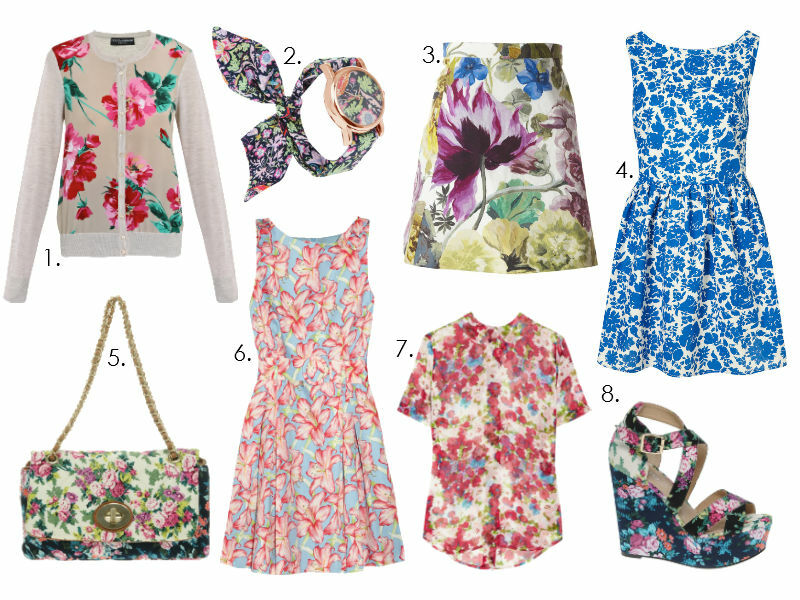 oh i love everything floral!!! !the watch and the wedges are superfabulous!!! Completely in love with anything floral! Love that Topshop dress! Flowers? One of my faves of season for sure! Thanks a lot for your lovely comment in my blog! I follow you now!